PRIMARY BONE GRAFTING:- Primary and early secondary bone grafting were practised mainly in the 1950s and 1960s by a whole generation of cleft surgeons. The indication for primary bone grafting was- elimination of bone deficiency, stabilization of the pre-maxilla, creation of new bone matrix for eruption of teeth in the cleft area and augmentation of the alar base. There were also expectations of normalization or even stimulation of maxillary growth. SECONDARY BONE GRAFTING:- Secondary bone grafting, meaning bone grafting in the mixed dentition, became an established procedure after abandoning primary bone grafting. The pre-requisites were precise timing, operating technique, and sufficiently vascularized soft tissue. 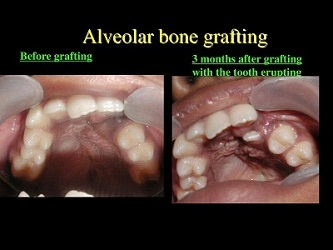 The advantages of primary bone grafting allowing tooth eruption through the grafted bone could also be maintained. Furthermore, secondary bone grafting can stabilize the dental maxillary arch, improving the conditions for prosthodontic treatment such as crowns, bridges and implants. It will also facilitate eruption of teeth increasing the amount of bony tissue on the alveolar crest allowing orthodontic treatment. Bony support to teeth neighbouring the cleft is a pre-requisite for orthodontic closure of the teeth in the cleft region. Thereby more favourable hygienic conditions will be achieved reducing caries and periodontal inflammation. Speech problems caused by irregular positioning of articulators, or escape of air through the oronasal communication may also be improved. Secondary bone grafting can also be used to augment the alar base of the nose to achieve symmetry with the non-cleft side, thereby improving facial appearance. LATE SECONDARY BONE GRAFTING:- Bone grafting has a lower success rate when performed after canine eruption compared to before the eruption. It has also been found that the possibility for orthodontic closure of the cleft in the dental arch is smaller than in patients grafted before canine eruption. In adults oral hygiene is of major importance. The surgical procedure should include drilling of multiple small openings through the cortical layer into the cancellous layer facilitating in growth of blood vessels into the graft.